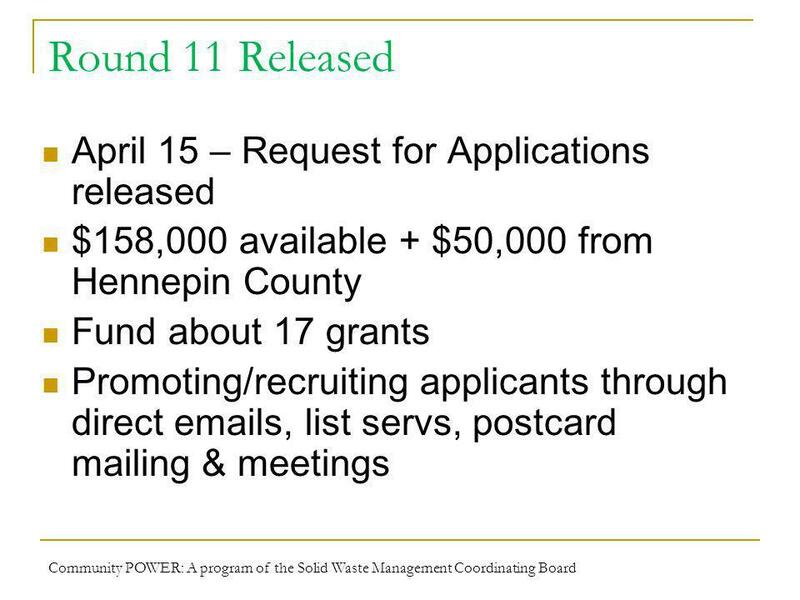 Community POWER Update: Rounds 8, 10 & 11 Laurie Gustafson, Program Manager April 27, 2011 A program of the Solid Waste Management Coordinating Board. 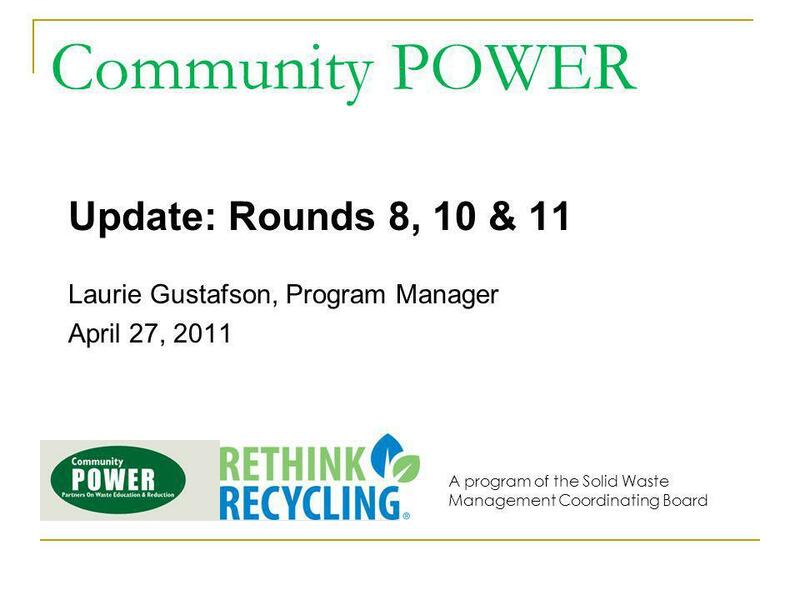 Download ppt "Community POWER Update: Rounds 8, 10 & 11 Laurie Gustafson, Program Manager April 27, 2011 A program of the Solid Waste Management Coordinating Board." 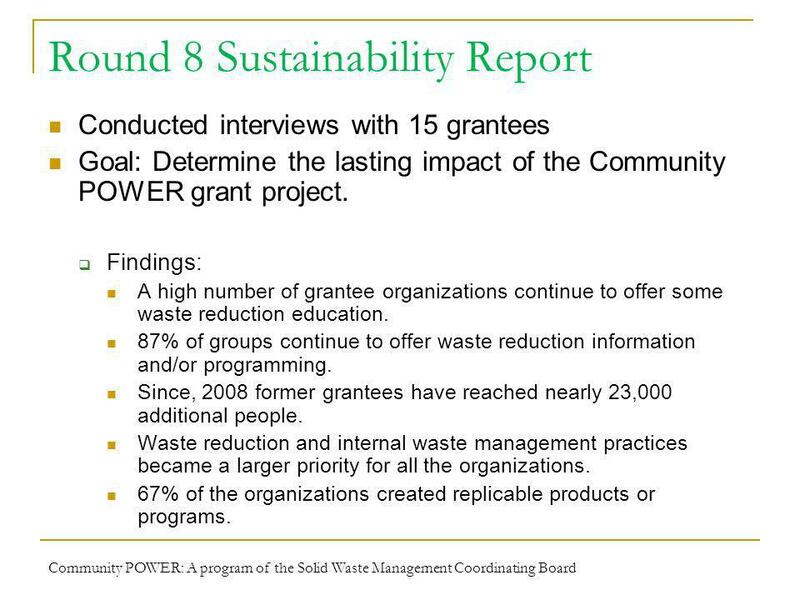 A Reuse and Recycling Enterprise with Multiple Benefits Presentation to Solid Waste Management Coordinating Board February 22, 2012. 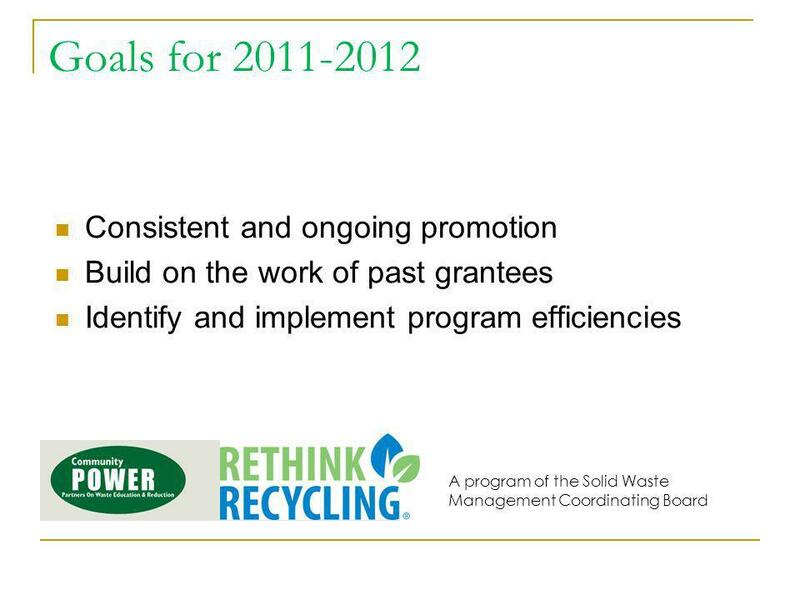 2011 Waste Reduction Toolkit and Campaign SWMCB 7/27/2011. 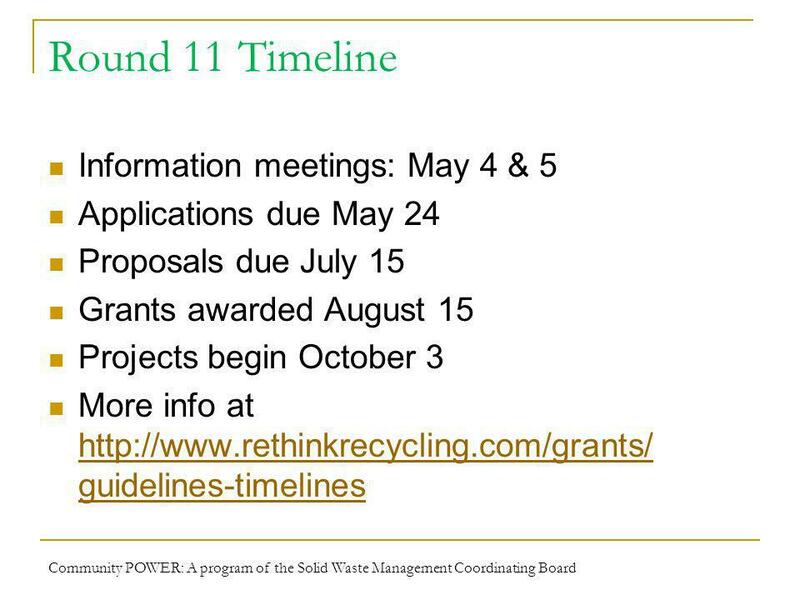 DRUG (R X & OTC) DISPOSAL PROGRAMS Solid Waste Management Coordinating Board 5/30/2012. 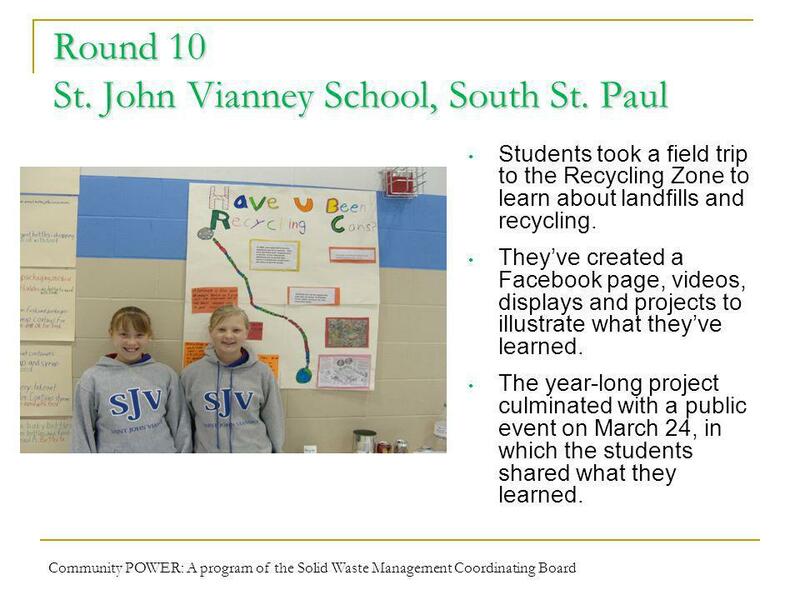 The New Community POWER Tara Roffler, Ramsey County and Community POWER Staff Liasion March 28, 2012 A program of the Solid Waste Management Coordinating. 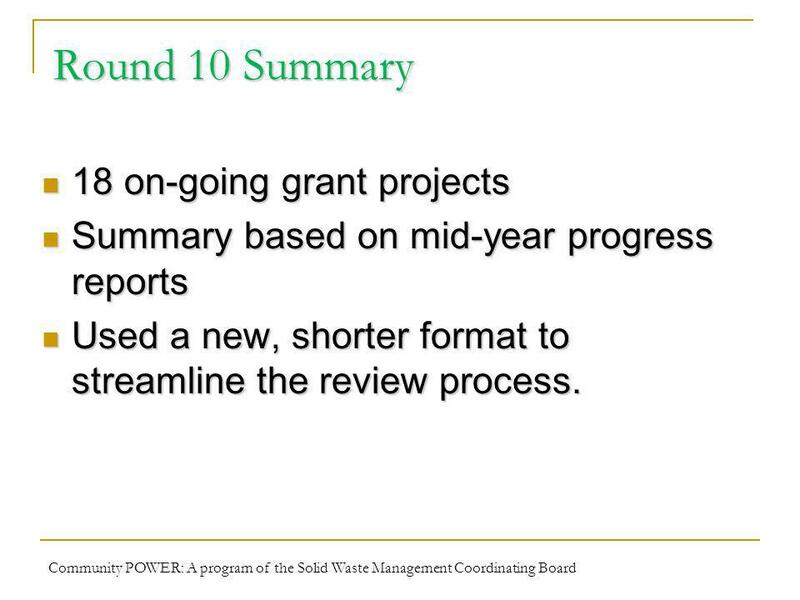 Community POWER Update: Rounds 9, 10, 11 & 12 Laurie Gustafson, Program Manager January 25, 2012 A program of the Solid Waste Management Coordinating Board. 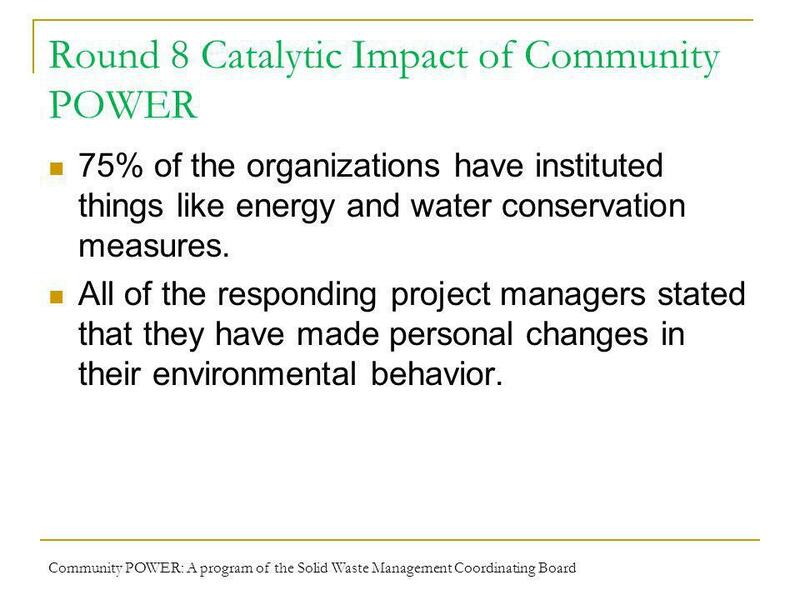 Community POWER Round 9 & 10 Update Laurie Gustafson, Program Manager April 28, 2010 A program of the Solid Waste Management Coordinating Board. 1 Briefing for WRIA 8 – Lake Washington/Cedar/Sammamish Watershed July 17, 2008. TDV Environmental Scan Jon Roesler, et al. TDV Reception August 12, 2010 St. Paul, MN. 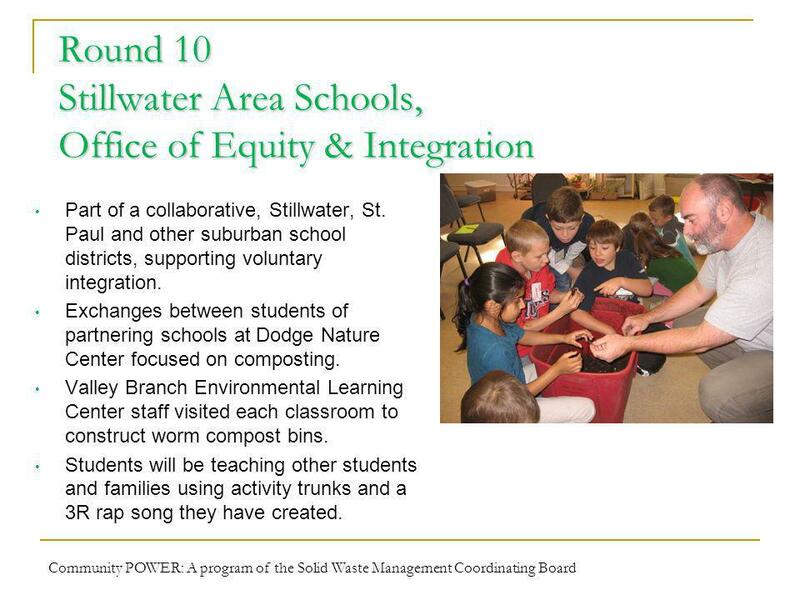 1 Inclusive Classrooms and Quality Rating Improvement System 391 Grant Funding April 2, 2012. 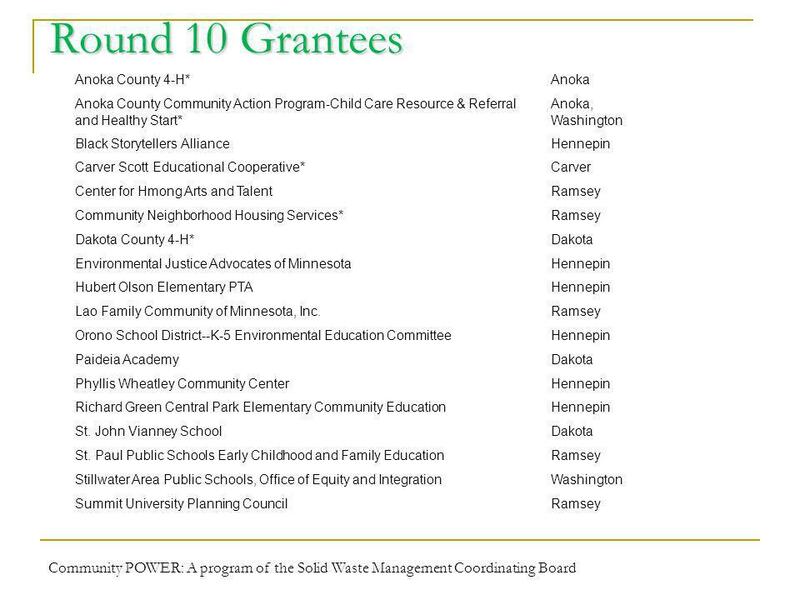 1 Alignment of Inclusive Pre-School Learning Environments and Quality Rating Improvement System 391 Grant Funding Board Presentation May 8, 2012. 1 The Massachusetts Early Learning Guidelines for Infants and Toddlers.